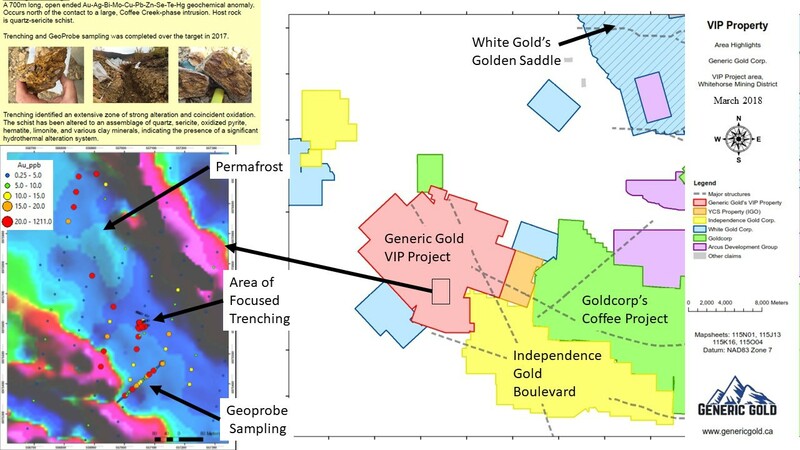 Toronto, Ontario--(Newsfile Corp. - March 6, 2018) - Generic Gold Corp. (CSE: GGC) ("Generic Gold" or the "Company") is very pleased to report that it has identified a significant gold-bearing structure, now named the Redbull Zone, on its VIP Project in the White Gold district of Yukon, Canada. The 2017 work program on the VIP Property consisted of mechanical trenching, geoprobe sampling, prospecting, soil sampling, and geological mapping. The bulk of work completed was focused on the Redbull Zone, which was previously identified as a significant soil anomaly with values up to 61.4 ppb Au which is highly anomalous for the White Gold district. A profile of geoprobe drilling at 5 metre spacing was completed across the width of the previously identified soil anomaly, which identified a 135 metre wide zone of oxidized bedrock with coincident anomalous gold mineralization. In addition, trenching defined clear contacts of oxidized and mineralized material and provided key structural details which will assist in future drill targeting. The Redbull Zone has a geochemical signature of Au-Ag-As-Bi-Cu-Pb-Sb-Zn-Se-Te-Hg and is more than 750 metres long, up to 360 metres wide, and open to both the North and South. A summary of work completed and highlights of the Redbull Zone can be seen in the accompanying map (link to figure 1). Figure 1: Redbull Zone — Soil sampling, trenching, geoprobe sampling results. President and CEO of Generic Gold, Kelly Malcolm, commented: "When we acquired our portfolio of Yukon projects from Nevada Zinc in May of 2017 one of our primary objectives was to advance the VIP Property to a drill-ready state. I am very pleased with the results of our 2017 program. Due to topographic and permafrost constraints, we were unable to trench across the Redbull Zone anomaly and in the most strongly mineralized areas, however, the work that was completed validated the soil sampling that was done previously and confirmed the bedrock potential of the area, while providing key details which will assist in drill targeting. The oxidized rocks we encountered, and their associated geochemical signatures, are very similar to those found associated with gold deposits in the White Gold area." The 100% owned VIP Project covers an area of roughly 17 x 13 kilometres, located 120 kilometres south of Dawson City, and is accessible by helicopter, nearby fixed wing aircraft airstrips, and nearby barge ports along the Yukon River. The project is in the White Gold district, approximately 20 kilometres west of Goldcorp Inc.'s Coffee gold deposits (2.16 Moz Au P&P Reserves, 0.78 Moz Au M&I Resources, 1.15 Moz Au Inferred Resources (Goldcorp Mineral Reserves & Resources, June 30, 2017)), along the interpreted extension of the Coffee Creek and Big Creek fault systems. The VIP Property is also contiguous with Independence Gold Corp.'s Boulevard property, Goldcorp's Apollo property, and White Gold Corp.'s recently staked Coffee Trend West properties. A single profile of geoprobe sampling was completed across the width of the Redbull Zone anomaly, consisting of 46 samples. The geoprobe sampling was completed due to topographic and permafrost constraints that limited the effectiveness of trenching. The samples were taken at 5 metre spacings and targeted the uppermost portion of bedrock (approximately 10 centimetres) and basal soils. Oxidized rock and soil was intersected over 130 metres (26 of 46 samples) crossing the anomaly. Within the oxidized suite of samples, all samples returned anomalous Au values ranging from 5 ppb up to 139 ppb gold. Four trenches were dug by a heli-portable excavator in the area of the Redbull Zone anomaly. Due to more permafrost than expected and variable topography, the trenching focused on a portion of the northeastern margin of the interpreted 700+ metre long northwest trending Au-Ag-Bi-Mo-Cu-Pb-Zn-Se-Te-Hg anomaly. Trenching identified an extensive zone of strong alteration and coincident oxidation. The altered and oxidized rock material was predominantly quartz-sericite schist that has been altered to an assemblage of quartz, sericite, oxidized pyrite, hematite, limonite, and various clay minerals, indicating the presence of a significant hydrothermal system. Key structural information was obtained from trench mapping, indicating a dominant NNW-SSE striking structure dipping 60 degrees to the west which mirrors an aeromag and coincident topographic lineament. Similar to the geoprobe sampling, each of the oxidized samples returned anomalous gold, reaching up to 43 ppb Au. In addition, a sharp contact was defined between mineralized material and barren wallrock, indicating a structurally controlled system similar to that of the Coffee deposits. Soil sampling and prospecting was undertaken in underexplored areas of the large property. Ridge and spur style soil sampling was completed in unexplored areas of the project, while follow-up grid sampling and geological mapping was conducted in areas identified as anomalous in previous exploration campaigns. A total of 65 rock samples and 658 soil samples were taken during the duration of the field program. New anomalous areas were identified, resulting in a total of nine separate areas across the large property with soil anomalies greater than 25 ppb Au, all of which are highly anomalous for the district and require follow-up work. Generic Gold will be exhibiting at PDAC, the world's largest mining conference, on Tuesday March 6th and Wednesday March 7th at booth 2215 (listed under Nevada Zinc Corporation). JDS Energy & Mining Inc., 2016, NI 43-101 Feasibility Study Technical Report for the Coffee Gold Project, Yukon Territory, Canada, effective January 6, 2016, pgs. 7-19. Kelly Malcolm, P.Geo, President and CEO of Generic Gold, is a Qualified Person, as that term is defined by Canadian regulatory guidelines under National Instrument 43-101, and has read and approved the technical information contained in this press release. Generic Gold is a Canadian mineral exploration company focused on gold projects in the Tintina Gold Belt in the Yukon Territory of Canada. The Company's exploration portfolio consists of ten projects with a total land position of 39,820 hectares, all of which are 100% owned by Generic Gold. Several of these projects are in close proximity to significant gold deposits with multi-million ounce NI 43-101-compliant resources, including Goldcorp's Coffee project, Victoria Gold's Eagle Gold project, White Gold's Golden Saddle project, and Western Copper & Gold's Casino project. Generic Gold's board of directors and management team is led by experienced mining industry professionals, with expertise in exploration, finance, capital markets, and mine development. For information on the Company's property portfolio, visit the Company's website at genericgold.ca. Certain statements in this press release are "forward-looking" statements within the meaning of Canadian securities legislation. All statements, other than statements of historical fact, included herein are forward-looking information. Forward-looking statements are necessarily based upon the current belief, opinions and expectations of management that, while considered reasonable by the Company, are inherently subject to business, economic, competitive, political and social uncertainties and other contingencies. Many factors could cause the Company's actual results to differ materially from those expressed or implied in the forward looking statements. Accordingly, readers should not place undue reliance on forward-looking statements and forward-looking information. The Company does not undertake to update any forward-looking statements or forward-looking information that are incorporated by reference herein, except in accordance with applicable securities laws. Investors are cautioned not to put undue reliance on forward-looking statements due to the inherent uncertainty therein.